Research interests: My current interests focus on the modelling of the late universe. The universe is observed to expand at an accelerated rate, with structures - from galaxies to clusters of thousands of galaxies and giant voids of hundreds of light years across - arranged in a cosmic web that started to form and evolved since soon after the ``big bang". I am particularly interested in two aspects. These structures evolved from small fluctuations into a non-linear regime, and this process has been so far investigated assuming a Newtonian approximation: I would like to understand the unavoidable contribution from Einstein general relativity theory that must arise on the largest scales and due to the nonlinearity of Einstein equations. Within general relativity, the simplest explanation for the observed accelerated expansion is a constant form of "dark energy", Einstein cosmological constant. However, an evolving form of dark energy may exist, possibly interacting with dark matter, responsible for structure formation. I therefore also work on models of dark energy and its interaction, or unified dark matter models where a single dark component tries to explain both the acceleration and structure formation. The beauty of this physics is that it will be put to severe tests by galaxy surveys of the next decade. I also worked on exact solutions of Einstein equations, and in general I am interested in applications of exact and approximated methods in general relativity and cosmology. I made pioneering work on second-order relativistic perturbation theory and considered applications in cosmology as well as to neutron stars. More recently, I made a pioneering contribution to the study of nonlinear structure formation using for the first time simulations based on Einstein general relativity theory. I studied physics at the University of Rome “La Sapienza” where I graduated in 1987, with a thesis on colliding gravitational waves, supervised by Valeria Ferrari. I then obtained a studentship from SISSA (Trieste, Italy) where I worked with George Ellis on covariant and gauge-invariant cosmological perturbations, completing my PhD in 1991. 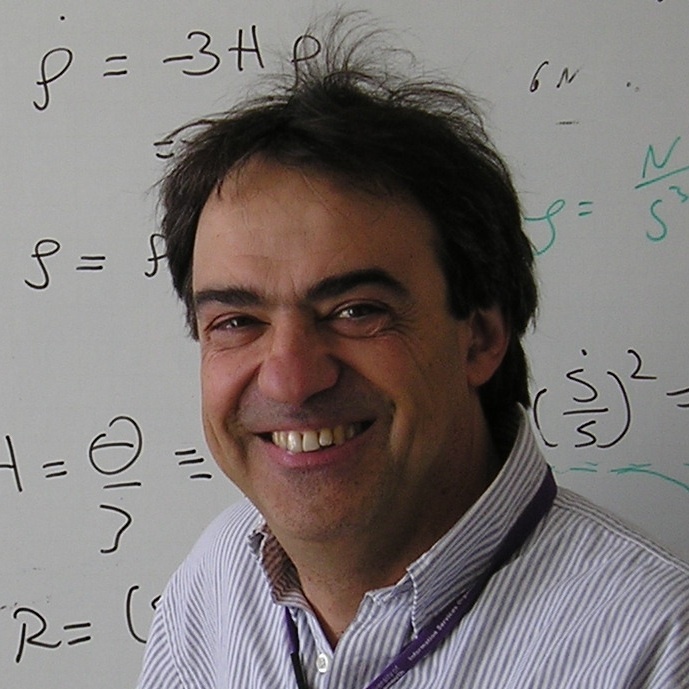 After postdocs in QMUL (London), ICTP and SISSA (Trieste), and Cardiff, in 1999 I joined the Relativity and Cosmology Group of the mathematics department at the University of Portsmouth as senior lecturer. In 2002 I became member of the newly formed Institute of Cosmology and Gravitation. In 2005 I was awarded a two year visiting professorship by the Italian government, which I spent at the University of Rome “Tor Vergata”. In 2006 I was promoted to reader. I have lectured undergraduates and postgraduate students in the UK, Italy, Greece and India, I have published over 50 scientific papers in international journals and given talks in five continents, Australia finally included in 2018. I am a keen photographer/traveller/mountaineer. Qualifications: Laurea in Fisica, Universita' di Roma "La Sapienza" (1987). Master in Astrophysics at SISSA (Trieste, Italy, 1989). PhD in Astrophysics at SISSA (Trieste, Italy, 1991). Achievements and recognition: In 2010 I was part of the UK-Japan research team awarded the Daiwa Adrian Prize 2010. In 2005 I was awarded a Visiting Professorship by the Italian government; this allowed me to spend two years on sabbatical at the University of Rome “Tor Vergata”. Grants: Co-investigator STFC Consolidated Grant "Cosmology and Astrophysics at Portsmouth" (2016-19); Co-investigator STFC Consolidated Grant "Cosmology and Astrophysics at Portsmouth" (2013-16); Co-investigator STFC Rolling Grant "Theoretical Cosmology" (2010-13). Roles and Collaborations: UK member of the Management Committee, EU COST-Action CANTATA, Cosmology and Astrophysics Network for Theoretical Advances and Training Actions, approved December 2015, Action CA15117. I was External Examiner for the Physics Degree, University of Kent (2010-2014). In 2013-2015 I led and coordinated the ICG involvement in the development of the new Physics, Astrophysics and Cosmology MPhys degree program; in 2008-2009 I co-developed a new BSc Degree in Applied Physics. I am member of the Faculty Student Experience Committee, Ethic Committee and Library Committee of the faculty of Technology. Postgraduate students supervised: Cristian Cherubini (2004; Joint PhD with Salerno, Italy), Andrea Nerozzi (2004, EU Network), Frances White (2005), Andrea Passamonti (2005), Kishore Ananda (2006), Irene Milillo (2010; joint PhD with Rome ``Tor Vergata", Italy), Nikolai Meures (2012), Hedda Gressel (2018). Cristiano Germani (2003), Virginia Re (2003, University of Salerno, Italy), Davide Pietrobon (2010, joint PhD with Rome ``Tor Vergata", Italy), Oliver Piattella (2010, University of Insubria, Italy), Valentina Salvatelli and Najla Said (2015, University of Rome "La Sapienza") also did part of their PhD work with me. My current PhD student is Natalie Hogg. Teaching responsibilities: Currently I teach and coordinate the module Introduction to General Relativity and Cosmology, and co-teach Mathematical Methods for Physics, both third year courses on the Physics, Astrophysics and Cosmology and the Physics programmes. Professional memberships: I am a member of the Institute of Physics, of the International Society for General Relativity and Gravitation and of SIGRAV (Societa' Italiana di GRAVitazione). From small scales to the horizon: a nonlinear post-Friedmann framework for structure formation in LCDM on 14th Aug 2012 5:00:pm Location: Benasque, Spain, workshop on "Modern Cosmology: Early Universe, CMB and LSS"